Plenty of fusion's going on in the culinary world today: David Chang's mixing Italian and Korean noodles; a food surgeon's Franken-welding candy bars; and now, people are making burgers out of sushi. Yes, the last remnants of normal food are finally converging into one bizarre, cold bite, as the formula of sushi + other thing continues to move toward the eventuality of sushi smoothies. Those will be disgusting. But from the jump-off point of sushi burrito, now, the world of Instagram brings you sushi burgers. Behold: a forthcoming dump of sushi burger photos -- and a video to boot! If you made it this far... thanks for doing that! 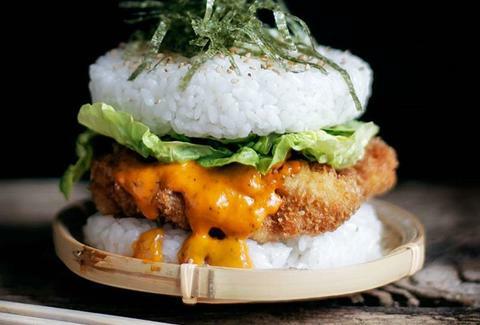 But the reality, as you see, is sushi burgers are basically just a rearrangement of the sushi components into different places; the rice is a bun, and the middle is in the middle. But it's the other middle. You get it. Is this bound to be a trend? No. Assuredly not. Look how small that one is in a woman's hands. But for now, we can share Instagrams of sushi burgers and laugh that we've advanced to such a place in horticulture that we make facsimiles of popular foods to look like other foods. We really have too much time on our hands. But at least they look neat! Ryan Craggs is Thrillist's Senior News Editor. Are you seriously still reading this? Follow him @ryanrcraggs.